Having a comfortable bed can be both a boon and a bane: you’d be able to get a good night’s sleep almost every day, but at the same time, it would be a struggle to leave the comfort of your bed every morning. We’d say it’s more of a boon though because there’s nothing quite like getting into bed and relaxing, after a long, hard day of work. Many of us think that it’s just high-quality mattresses and pillows you need to make sure the bed is comfortable, however, bed sheets are just as important. Since there isn’t as much information about them, in this article we will explain how you can choose the best bed sheets for yourself, and also give you a list of the top 10 bed sheets you can buy online. While many will tell you that all you need to look at is the material, design, and size of the bed sheet you’re interested in, we are here to inform you that there are actually several other factors that you must keep in mind if you want to buy the best bed sheet for your bed. The first thing you need to decide when you’re buying bed sheets is whether you want them to fitted, or whether you’d like them to be flat. Both types have their own pros and cons, so choose the type that suits your needs the best. If you hate tucking in edges of bed sheets, then fitted sheets will be your best friends; they’re much easier to use, all you need to do is get the corners. Another benefit of using fitted sheets is that they do not crease as much, so you do not need to spend time ironing them either. Therefore, if you’re looking to save time, then these are perfect for you. If you’re more concerned about the designs the sheets have and don’t mind if they take a bit longer to put on, then flat sheets are for you. With these sheets, you have to make sure that the edges are tucked in properly, and you’ll most likely have to iron them after washing, as they get creased much more easily. There’s a lot of talk about thread count, and most people will tell you that a higher thread count will definitely equal to better quality sheets. However, it’s not that simple, and aside from the thread count, you must pay attention to the material as well. 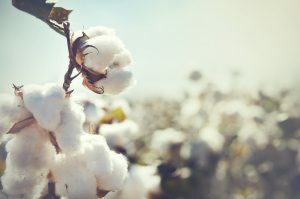 Good quality cotton doesn’t need to have really high thread count numbers, while low-quality polycotton can have a high thread count and still feel rough. Therefore, make sure that you’re not blinded by the thread count, and pay attention to the material as well. The type of material you choose for your bed sheets should be based on the climate because certain fabrics are more suitable for certain temperatures. If you choose the wrong type of material, you could be left feeling incredibly uncomfortable while sleeping, so make sure that you pay attention to this bit. If you live in a region where summer months are way longer than the winter ones, then cotton would be the way to go for you. It’s the most breathable fabric, so it won’t make you feel hot and sweaty during the night, and it’s one of the best materials for those with sensitive skin as it reduces the chance of allergies. Lower thread count doesn’t always mean low quality, because a lot depends on the quality of cotton itself. Therefore, you must check reviews to know about the quality of the cotton threads, and then consider the thread count. Remember though, good quality, durable cotton sheets can be quite expensive, and need to be ironed to remove creases, so their up-keep will take more time. Microfiber is a fabric made of closely woven fibres, wherein each fibre is finer than even silk fibres, which makes microfiber sheets really soft and comfortable. While individual threads of microfiber are not that strong, when they’re woven together, they can be pretty strong, so they do not easily tear. Since natural fibres are usually not as thin, most microfibers are made artificially in labs, therefore, they’re not the best for those with really sensitive skin, as they could be allergic to them. Additionally, since these fibres are woven together really closely, microfiber sheets are not as breathable as cotton sheets and are better for cooler areas, or for people who don’t get too hot. 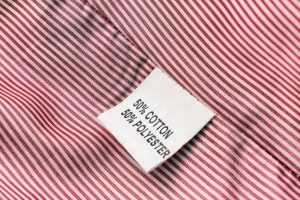 Fabrics that are made using both cotton and polyester are called polycotton, and since they’re not 100% cotton, they tend to be slightly cheaper. Polycotton sheets are warmer than cotton ones, as they are not as breathable and trap more heat, therefore they’re more suitable for slightly cooler temperatures. 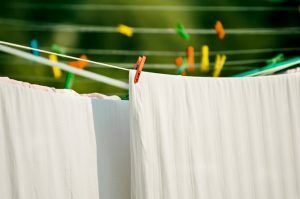 Using polycotton sheets in summer is not uncommon, although if you’re someone who gets really hot while sleeping, then you might end up sweating a lot with such sheets. It’s also hard to judge how the quality of sheets would be, as higher thread count doesn’t always ensure better quality with polycotton. This may seem like obvious advice, but there are many who simply measure their beds, and forget to measure their mattress. You must take the height of your mattress into account while buying a bed sheet because if you don’t, you might end up with sheets that are too small, and would leave the edges uncovered. One of the best things about having white sheets is that they look brand new for a long time, however, sheets with prints and colours fade much more easily and start looking old sometimes from the second or third wash. Make sure you check the reviews to know whether the bed sheet you’re interested in doesn’t fade easily and the colours look vibrant for a long time. 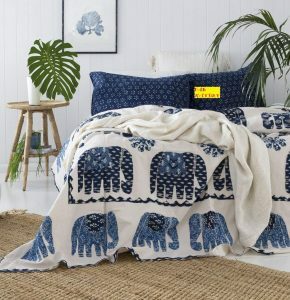 Now that you know everything you must keep in mind while buying bed sheets, let us reveal our top 10 picks for the best bed sheets you can buy online in India. If you’re lucky, you might even find them at discounted rates, as Amazon and Flipkart often have sales! This fitted sheet is perfect for those who have beds and mattresses of unusual measurements, as you can get the size customised to fit your needs. Since it can be quite hard to find sheets, especially fitted ones, if you don’t have a standard size bed, this could be a great solution. The sheet is really soft and comfortable, so you would have no complaints there. However, despite the claim of being a 100% cotton sheet of 200 thread count, it doesn’t feel like it’s made purely of cotton and seems much more like polycotton. Therefore, it may leave you feeling hot and sweaty during the summer months. Additionally, the colour tends to bleed and stain other clothes, so we recommend washing this sheet separately. This 100% cotton bed sheet is absolutely wonderful for those looking for soft, breathable options for summertime. This has a thread count of 160 and is extremely comfortable, so you won’t wake up all sweaty in the middle of the night. 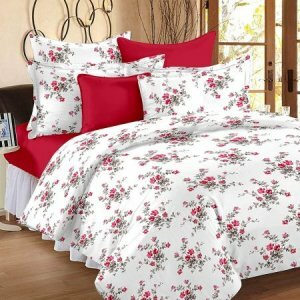 It is a flat bed sheet with a simple print, so you do not have to worry about the size as much, as long as you don’t buy a size too small. Although this has an alright thread count, the sheet doesn’t feel very durable and is in fact quite thin. The print is also not of the best quality, as it is not as bright as it appears in the image, and it fades quite a bit after the first wash. Additionally, since this flat sheet shrinks upon washing, we recommend buying a slightly larger size, so you’re not left with uncovered edges. 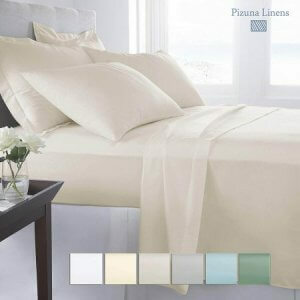 This pure cotton bed sheet is perfect for summer months, as it keeps you cooler and feels really comfortable. The print is different from the usual floral kinds, and the colours do not fade even after several washes. Since it is a flat type sheet, it is really easy to iron, and also convenient to store, as it doesn’t take as much space as a fitted sheet. It is quite an expensive purchase though, especially considering the low thread count of 120, which makes it appear really thin and less durable. You must be careful about the measurements though because on the description it says it should fit a 7 feet bed, but it seems it’s a bit smaller, and will only fit a 6 feet by 6 feet mattress. 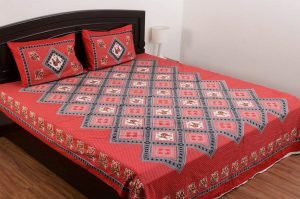 If you’re looking for a cotton bed sheet with traditional Jaipuri block print, then this is the one for you. 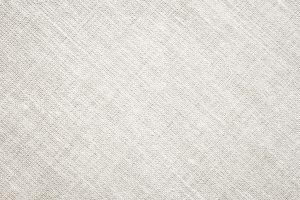 Although it doesn’t clearly state if it’s 100% cotton, it does feel like pure cotton and could be compared to how khadi feels. 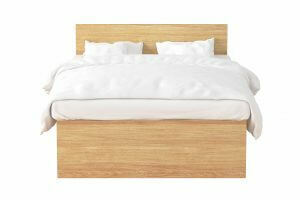 The size is big enough for even king size beds, and it’s really breathable, so it’s recommended for summer. The pillow covers are a bit of a disappointment though, because their colour fades after a few washes, and they feel quite rough against the skin. The stitching doesn’t seem up to the mark either, especially considering how much this costs. Additionally, the white is not a stark white and is actually more of a creamy white, so if you’re not a fan of that, then this isn’t for you. This pure cotton bed sheet with a 160 thread count is really comfortable and breathable, which makes it absolutely perfect for summer. 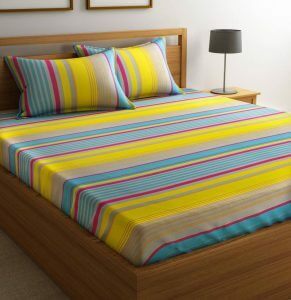 The size is big enough for even king size beds, and it has a simple traditional print with vibrant colours. Since it has a considerably high thread count, it is also quite durable and doesn’t rip after a few washes. 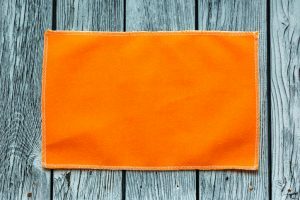 Although the colours are bright, they do fade a little after the first few initial washes, so we recommend washing this sheet separately, to avoid staining other clothes. Additionally, since this a flat sheet, you might occasionally want to leave the edges out, but in that case, this sheet wouldn’t look the best, as the edges are not stitched and look a bit rough. Those looking for a double bed microfiber sheet for a 6 feet by 6 feet mattress, will love this sheet. It has 152 thread count, which makes it really durable, so it won’t tear after a few months. 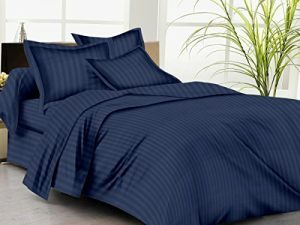 It is really comfortable and soft flat sheet, recommended for use in wintertime, as it helps keep the bed much warmer than cotton sheets would. It’s better to wash this sheet separately though, as the colours do tend to bleed, and could transfer onto other clothes. 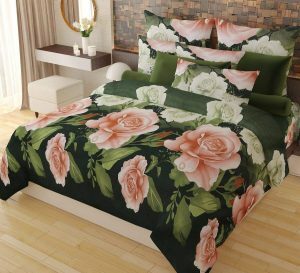 The print is also not as bright as it appears in the images, so if you’re not okay with a slightly darker bed sheet, then this wouldn’t the best for you. Furthermore, it is quite expensive for a flat microfiber sheet, so if you’re on a budget, this isn’t for you. If you’re looking for an affordable, 100% cotton bed sheet, to help you stay cool during summer nights, then this is the one for you. It is the most economical option on the market and highly recommended for those with sensitive skin, or those who get really hot while sleeping, as it’s made of pure cotton, which makes it really comfortable and breathable. This flat sheet has a thread count of 144 though, so it may seem a bit thinner compared to some others, and it wouldn’t be great for use in winter months. The colours are also lighter than how they appear in the images, and they fade a wee bit after about 4 to 5 washes, so if you’re not okay with a less brightly coloured sheet, then this isn’t the right one for you. 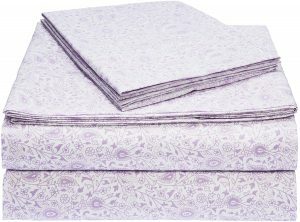 One of the best microfiber sheets set to invest in, this comes with a fitted sheet, flat sheet, and 2 pillow covers, so you get everything you need to make your bed look beautiful! These sheets are big enough for king size mattresses, and the fitted one works well for even thick mattresses because it has deep pockets to ensure a perfect fit. Since these sheets are made of microfiber, they’re much warmer than cotton ones and are recommended for use during winter months. They’re also really soft and comfortable, so you won’t feel uneasy while sleeping on them. Furthermore, the colours do not fade, and the sheets are easy to maintain as they do not need to ironed. 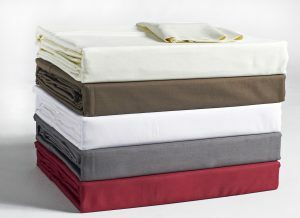 This 100% cotton fitted sheet has a 400 thread count, which is one of the highest thread counts on the market in India. It feels like the sheets they use in hotels, as it’s thick, soft, and comfortable. It can be used on a 6 feet by 6 feet mattress, and since it has deep pockets, even if the mattress is 30 cm thick, it shouldn’t make a difference to the fit. 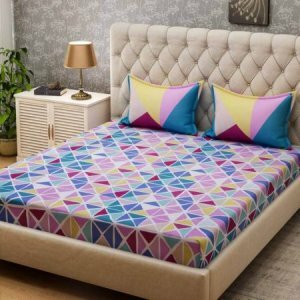 The best bed sheet you can buy online in India, this 100% cotton flat sheet has a 144 thread count and is both durable and affordable. We highly recommend this to those who’re looking for inexpensive options for summer months, when you sweat a lot more and need something that is actually breathable. It almost feels like polycotton initially, because it seems too silky to be cotton, however, after you’ve washed it once, it’ll feel soft and comfortable, just how high-quality cotton is supposed to feel like. The colours also do not fade easily, so you needn’t worry about washing it separately, and it looks just as fresh even after 8 months of use! Buying bed sheets online can be an intimidating challenge, because it’s easy to be overwhelmed by the number of choices, as well as the number of reviews online. However, if you know all the points you need to keep in mind, you won’t have anything to fear, and you’ll be able to select the best bed sheet for yourself. We hope our article helped you learn about all the important aspects you need to keep an eye out for while buying bed sheets, and we also hope that our list of top 10 best bed sheets helped make the process of choosing one much easier for you.